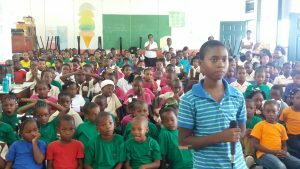 The Royal Saint Lucia Police Force continues to engage in constructive community activities, particularly where youth outreach is concerned. 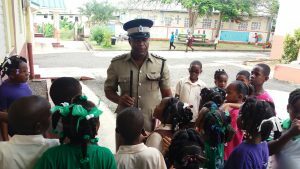 On Wednesday, May 11, 2016 it was the turn of the Desruisseaux Combined School to receive a special visit by Commissioner of Police Severin Monchery and some members of his Executive. The Commissioner who also hails from the community of Desruisseaux was delighted to address the entire student body. 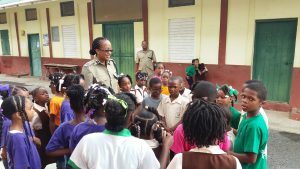 After having the pleasure of being read to by the Commissioner and other police officers, the students took the opportunity to pose several questions to the senior members of the RSLPF. Central to the day’s discussions were issues of the fear of self-expression or “speaking up” and the issue of Child Abuse. Students were advised by the group of police officers to report anyone who abuses them to the police or trusted adult.